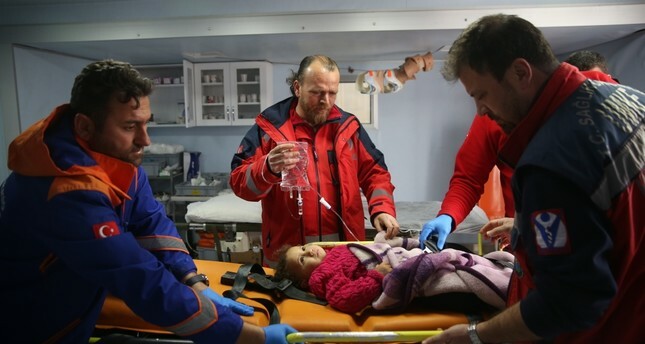 Paramedics attend a sick Syrian child at a clinic near the Turkish-Syrian border. Along with health services offered at Turkish hospitals, healthcare staff is deployed to the country's border with Syria. With over $30 billion spent for the well-being of Syrian refugees, whose numbers in Turkey exceed 3.5 million, Turkey tops the list of countries restoring the health of refugees worldwide with the cost of health services surpassing $10 billion, according to the World Health Organization (WHO). The cost of health services offered to refugees surpasses $10 billion, putting it at the top of the list of countries offering most services to refugees, according to the World Health Organization (WHO). Turkey is home to the largest Syrian refugee community in the world at more than 3.5 million people. Since 2011, Turkey has received a constant flow of displaced Syrians fleeing the conflict and their numbers have expanded from mere thousands to millions. Championing the international efforts for refugees, Turkey spent more than $30 billion for the wellbeing of refugees, but Ankara criticizes other countries for spending less on humanitarian aid for Syrians and the low numbers of admission granted by European countries for migrants. The conflict in Syria has killed more than 500,000 people and forced more than 5 million people to flee, while some 7 million remain internally displaced. Along with free access to services provided by public hospitals, refugees also benefit from clinics set up at the refugee camps near the Turkish border. The Health Ministry occasionally conducts vaccination campaigns as well with charities offering free medical check-ups especially for those living outside the camps. Recently, Turkey has also joined forces with the WHO to train hundreds of Syrian doctors and nurses to overcome the language barrier for refugees in access to health services and to boost health literacy and awareness to diseases for refugees. A survey on the health state of Syrian refugees living in Turkey jointly conducted by Turkish authorities and the WHO delved into the health problems and access to services for refugees. Professor Şerefnur Öztürk, head of the Turkish Neurology Association, says although Turkey offers all services for free for refugees, some 60 percent among them did not have health literacy or were reluctant to use the services due to language barriers and other cultural reasons. "The survey shows half of refugees never had their blood pressure examined in their lifetime. This is a great problem in terms of stroke and paralysis risk. High consumption of salt among the refugees aggravates the problem, according to Öztürk. Another one third never underwent treatment although they were diagnosed before. Only 30 percent of diabetes patients among refugees prefer medication," Öztürk says about the health literacy of the refugees. Öztürk adds that some refugees turned to herbs for cure as part of their customs. She also highlights that a 40 percent prevalence of obesity is tied to malnutrition and undernourishment among refugees. "Almost none have the habit of regular consumption of fruits or vegetables," she points out to another potential health problem for refugees. War-related health conditions also take a toll on the refugee population. Some 27 percent of refugees are smokers and another 80 percent suffer from sleeping disorders.